Why limit grilling to lunch or dinner? Hearth & Home, VESTA Award Finalist for Barbeque Accessories - 2012. Start the day off right with a breakfast sandwich grilled just the way you like it. Preheat the grill to 350°F with island grill stone. Saute onions, garlic and green onions on the grill stone. Simultaneously roast bell peppers. Once done, remove the veggies off the heat and allow to cool in a bowl. Transfer the roasted bell peppers to ziplock bag. Cook biscuits on the grill. Once done, remove them off the heat. Meanwhile mix the cooked vegetables with sausage and Cholula sauce. Make 3-4 inch sized patties as shown in the video. Season with salt and pepper. Grill the patties until they are cooked. Flip when one side is cooked. Cook eggs on the grill, season with salt and pepper. 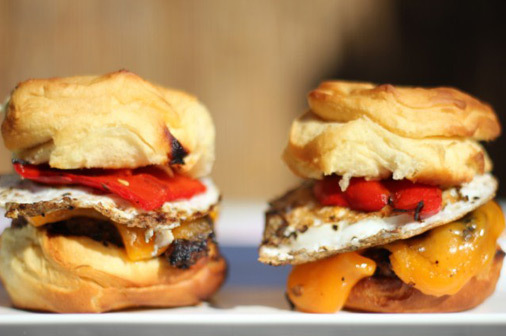 Place the grilled patties over the biscuits, top with cheese slices, sunny side eggs, roasted bell pepper and cover with another biscuit. Spread the word and pass along this recipe to a friend. Submit a recipe. If it’s published, we’ll send you free stuff! © 2019 Island Grillstone. All Rights Reserved.